Fishing Yaks: Should a Kayak Be Your Next Boat? Want to catch striped bass like this one (my biggest fish from last weekend)? Then remember these tips. When it comes to fishing for striped bass, I’m something of a nut. In fact, the third book I wrote, Rudow’s Guide to Rockfish, is about nothing but striper fishing from cover to cover. So now and again, people ask me for a striper fishing tip or two. Without fail, these three must-know striped bass fishing tips are often a topic of conversation; make sure you commit them to memory. Want to catch striped bass like this one (from last weekend)? Then remember these tips. 1. Look for thermoclines, especially where they intersect with structure, and try fishing that depth. Stripers are fairly temperature-sensitive, and will often stage around thermoclines. Of course, they also like to stage around structure. 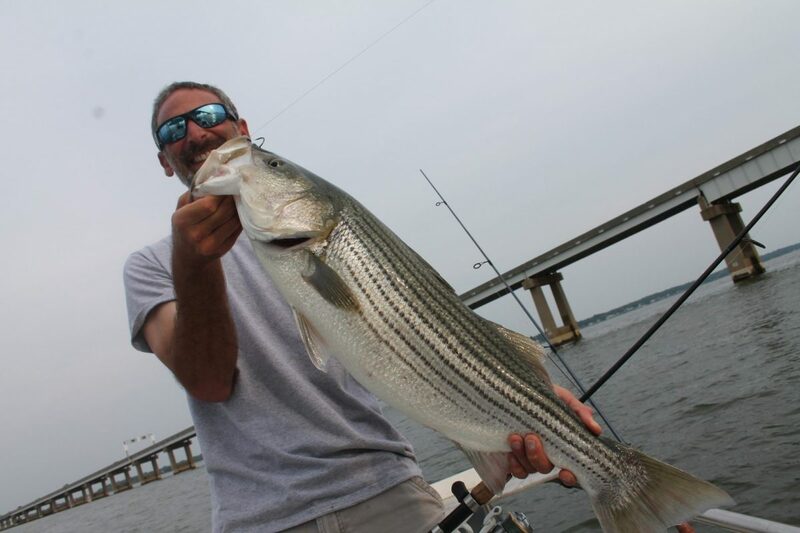 Put the two together and bam – you have a prime striper fishing spot. Trollers working open water should also keep an eye out for thermoclines, as even when the fish are scattered over large areas they’ll often relate to it. 2. When fishing with live baitfish, always give stripers a five-count before setting the hook. If you’ve caught stripers I’m sure you’ve noticed they have sandpaper-like teeth. This is an indication of how they feed; they grab and shake a live fish, usually lengthwise (unless it’s very small), chomping down hard to injure it. Then they turn the fish to swallow it head-first. With live baits of any serious size, if you set the hook too soon the striper is still in chomp-and-shake mode, and there’s a good chance the hook isn’t in its mouth yet. Wait four or five seconds, however, and it will have turned that baitfish and sucked it all the way into its mouth – along with your hook. 3. When fishing with lures, gauge the speed and erratic nature of your retrieve by the water temperature. In 50-degree water, stripers usually respond well to a slow, fairly steady retrieve. But try that in 80-degree water and you won’t get many bites; they want that lure to go zinging around, darting back and forth, zipping past like a scared, desperate critter. BONUS TIP: A horizontal presentation almost always works better than a vertical one, when it comes to stripers. Instead of parking your boat right over a school of fish, try to position yourself 50′ or 60′ away from the school, and retrieve your offering through it.